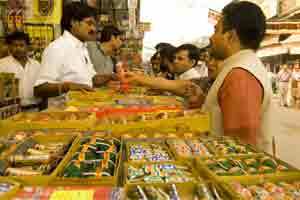 New Delhi: Corporate houses have reduced their gifting budget by 30% this Diwali on account of high inflation and rising interest rates, an industry body study has said. “Companies operating in sectors like pharmaceuticals, real estate, FMCG and civil aviation have cut down their Diwali budget by 25-30% this year compared to the last year," Assocham secretary general D. S. Rawat said. The study said that companies that have not cut down the number of people to give gifts, have opted for cost-effective Chinese goods. “Some multinational corporations are importing gifts for their employees from China as buying in bulk saves them a good amount of money," the study said. It said sluggish economic growth in the western markets are putting pressure on the companies’ bottomlines, thus, leading them to tighten their belts. Orders for electronic goods like iPods, digicams, camcorders, mobiles and portable DVD players have come down, the study said. However, affordable e-tablets, mobile phones and watches, are more in demand.